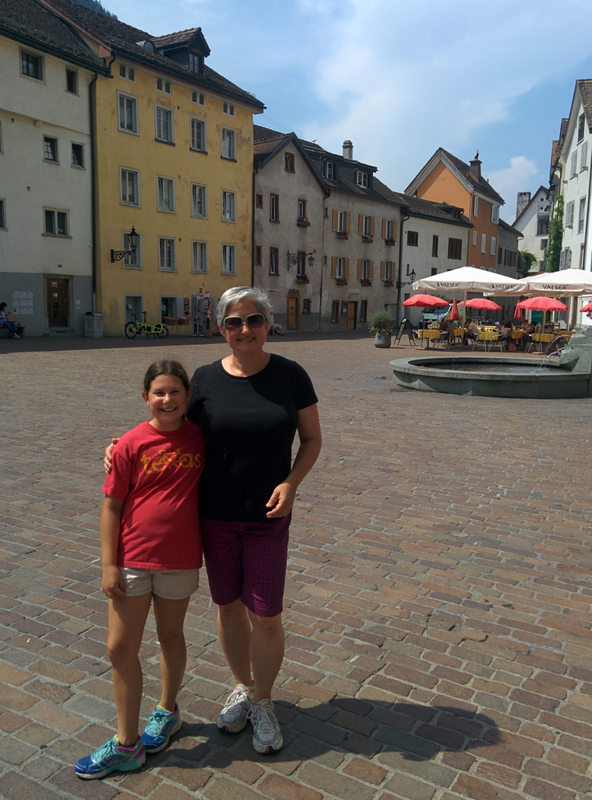 There are so many great things to tell you about our time in Disentis, but first a detour. 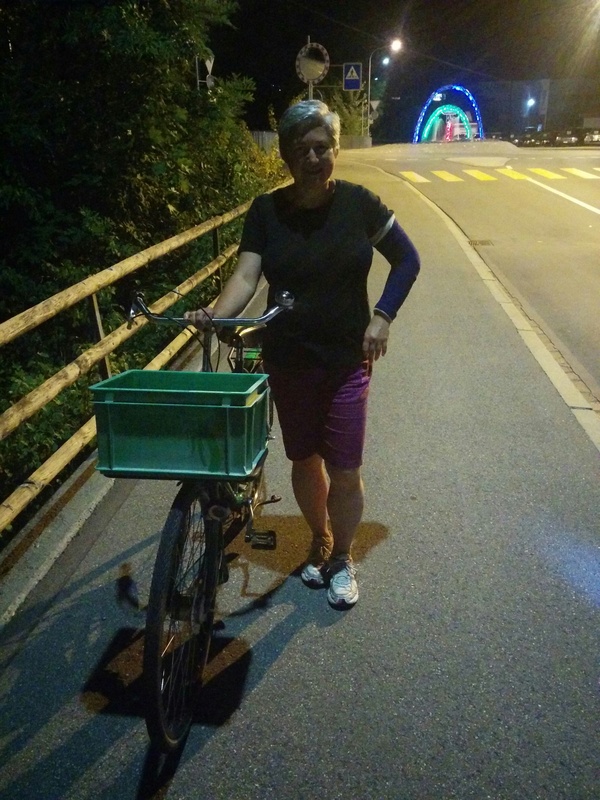 In talking about this bike trip down the Rhine, I’ve often said, “We don’t really have plans, we have an idea.” Our trip has not been planned in detail. We’ve had a general concept for it, but no real schedule. The idea being we would get on the bikes with a general route and a destination in mind and simply start pedaling. Well, there has been a change of plans. On Friday we woke up in our tent on the edge of Chur, Switzerland. We hopped on our bikes to ride into town. I led the way, Jette followed me, and Mila followed Jette. 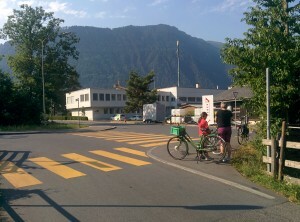 We rode down a narrow lane, past some stables, and came to this intersection. It’s hard to tell from the photo, but the street where the camera is positioned is only narrow enough for one car, but it is two-way. Drivers wanting to come down the street (towards the camera) often stop in the street near the crosswalks to let cars already on the street (coming towards them) pass so there is room for them to enter. What I am trying to say is that they take turns in each direction. Anyway, as we entered the intersection, there were cars queued up waiting their turn, and traffic in the cross-street from other directions too. 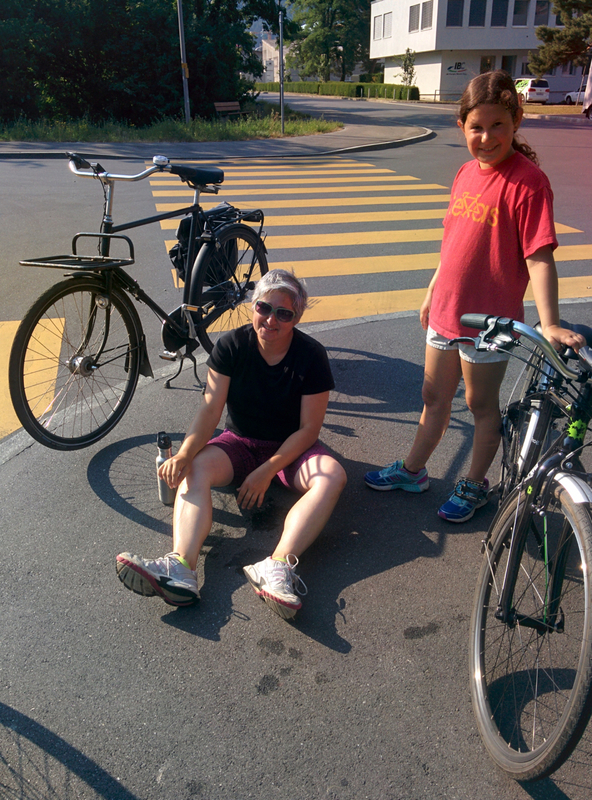 Jette and I passed through, but Mila was some distance behind us and decided to move onto the sidewalk (where she and Jette and bikes are in the photo) to let the traffic clear. She misjudged the curb, caught her front wheel, and took a dive. She was only moving at walking speed. The bike went down to the right, but she went high-side over the bike to the left. She banged and scraped her leg, and caught her fall with her left hand on the ground. There was no road rash, and at first it seemed her banged up and slightly scraped leg was the worst of it. 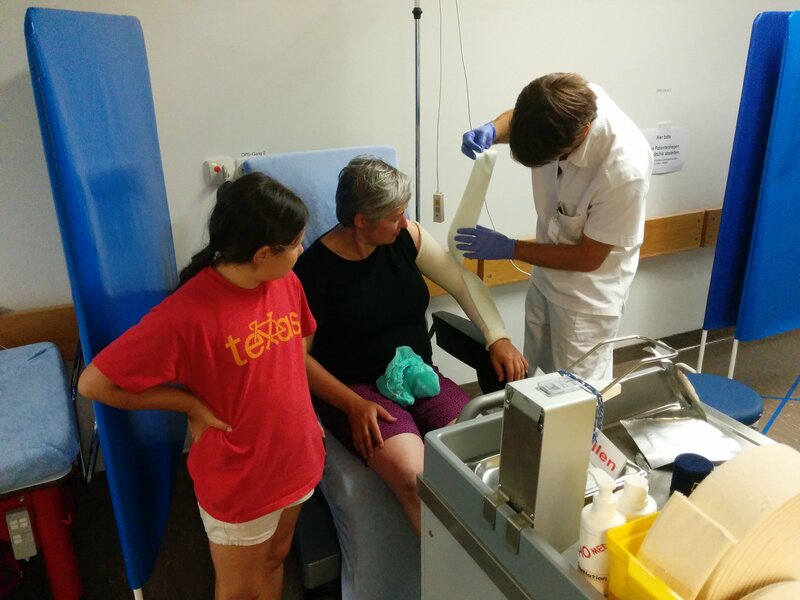 As the adrenaline rush faded, She realized that her arm, which had seemed “stunned” and weak, was perhaps more injured than she first realized. She was unable to straighten it, and was having a hard time using it. Those of you who know Mila, know that among her many fine characteristics, you will find persistence and willfulness. So, unwilling to let a small tumble slow us down, she got back on the bike and we rode into town. We had a nice, if somewhat blurry, breakfast at the bakery in the awesome Migros supermarket. 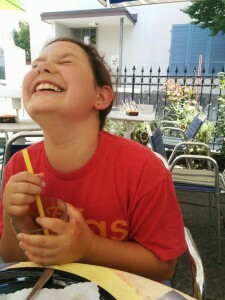 We rode into the old city, parked the bikes walked around, explored the shops, and found some refreshing iced tea. All the while Mila was waiting for her arm to start feeling better. She rejected our suggestions to find a doctor to check it out, but by about 4:00 it was not feeling better. It was still mostly non-functional. So, we asked one of the staff members at Migros, our favorite supermarket, for directions to the nearest hospital. He indicated that it was a good distance away and suggested a doctor across the street. We went to the doctor across the street. 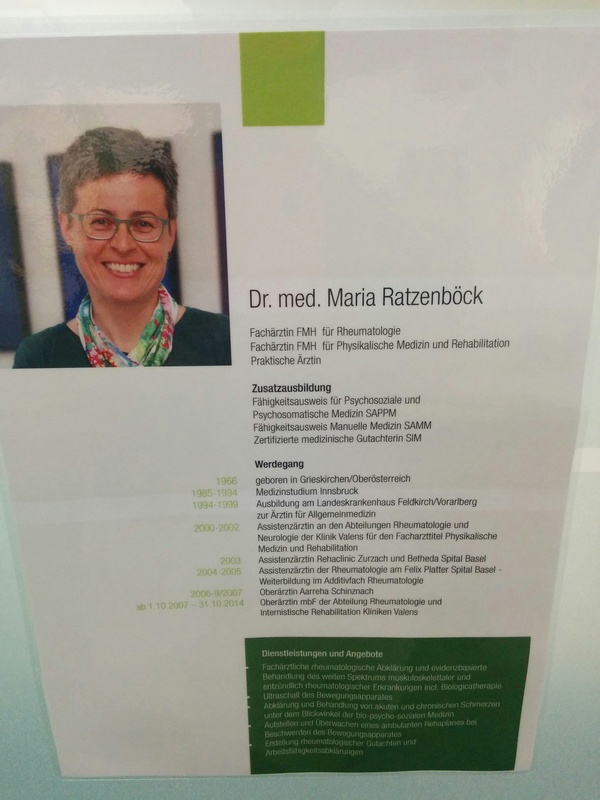 He was a pediatrician who sent us another couple blocks to Dr. Maria Ratzenbock. 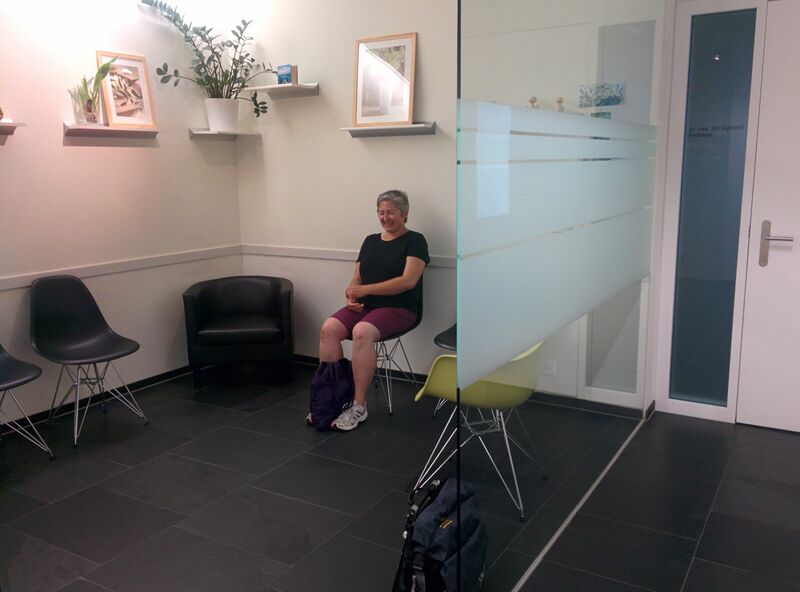 Swiss doctors have waiting rooms, but you don’t wait long. 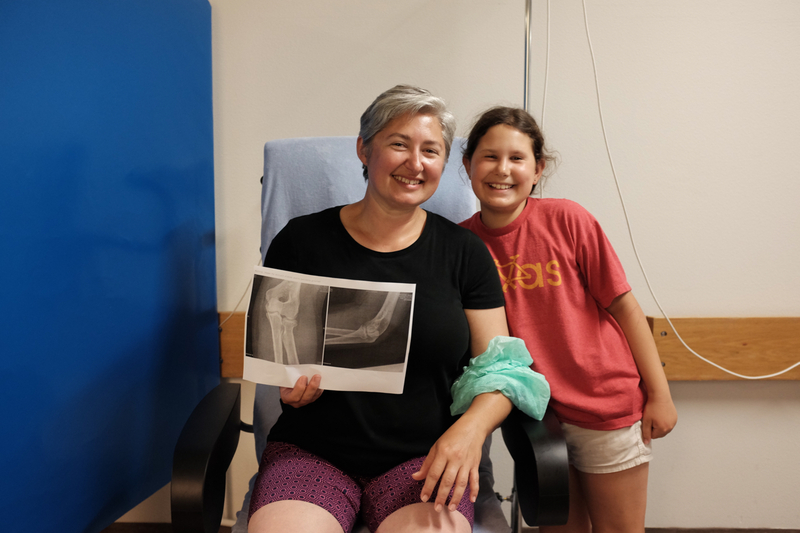 Dr. Ratzenbock spent quite a bit of time with Mila, suggested pain medication (and lots of it), which Mila declined, and took her for an x-ray. The x-ray confirmed a fracture, and so we were given directions to the hospital emergency room with the suggestion that Mila not eat or drink because one shouldn’t do that before surgery. We hopped in a taxi and to the hospital we went. Mila was seen swiftly by an intern, a resident, and a surgeon, all of whom had an excellent bedside manner. More x-rays were taken from different angles, and it was determined that surgery was not necessary. 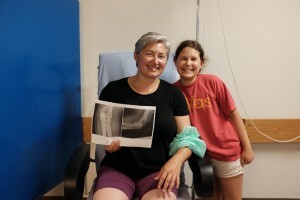 The doctor put Mila’s arm in a cast, gave us instructions, answered our questions, and gave us a letter detailing everything to provide to the next doctor Mila sees when it is time to remove the cast. I didn’t get a shot of it, but the surgeon had Jette assist him in the wrapping of the cast, which was pretty cool. Once wrapped, the doctor asked Mila if it was starting to feel warm as it hardened. That was a great opportunity for a quick chemistry lesson, so Jette and I discussed exothermic reactions, endothermic reactions, instant hot and cold packs as examples, and the Greek roots and meanings of the words. All-in-all, and the injury aside, it was an excellent experience-much better than we would expect at home. We paid cash at the doctor and the hospital and the total was less than $600 for everything. Wow! (That’s less than the deductible on our travel medical insurance). 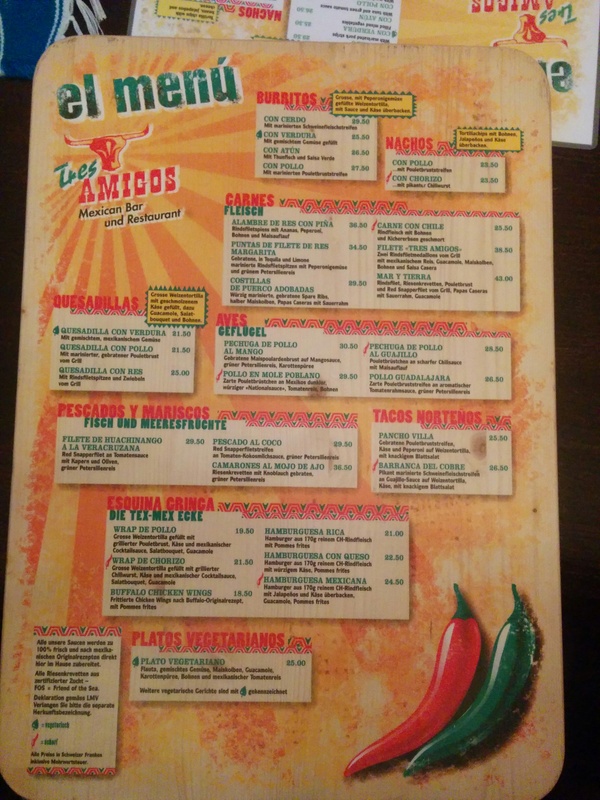 There was a bus from the hospital to within a block of where our bikes were parked, so we hopped on the bus back to the center of town and stopped a Tres Amigos, restaurant in the train station that was still open, for a very late dinner of Swiss-style Tex-Mex (is that really a thing?!). 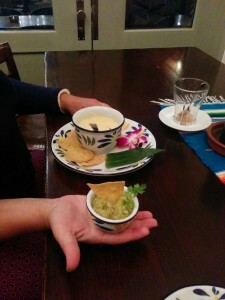 This is what $10 buys in Swiss guacamole! 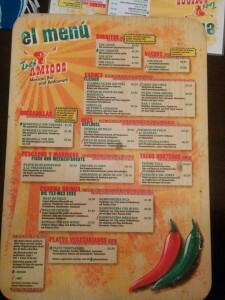 POP QUIZ: How much do Nachos Con Pollo cost in US Dollars? 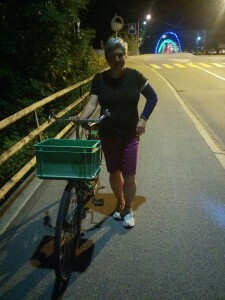 After dinner, at almost midnight, we got our bikes and rode/walked back to our campsite. Mila insisted on walking her bike back herself. Did I mention that she is willful? We’ve spent the past couple days trying to rest a bit, get our computers, phones, cameras, etc. charged and trying to get online. Did I mention that our travel power adapters were lost or stolen? It has been a challenge getting things charged. Regrettably our tent does not have power outlets! It seems that none of the cafes in Switzerland do either! Luckily, our tent is in a campground on the edge of town that happens to be right next to a really fantastic public swimming pool with two awesome water slides, so Jette and I took advantage of that yesterday, and plan to again today. Mila will be in the cast for a week or two and once the cast is removed the doctors have said she should use the arm but not lift anything heavy or put the arm under load for an additional six weeks. That kind of puts in kink in our planned bike trip, eh? We’ve been trying to figure out what to do and how to adjust. We’ve decided to stop the Rhine trip for now and come back to complete it next Spring. So now the plan is to go back to Amsterdam for a month (much cheaper than Switzerland and lots to do) where Mila can recover and get her cast removed, then onto Asia. India? Indonesia? Thailand? Singapore? We’ll have to check ticket prices and figure that out. We looked into storing the bikes here in Chur, but we were able to get a spot for them on the night train to Amsterdam (no small feat in high season and last minute) so we will take them to Amsterdam and hopefully find a place to store them for the next 10 months while we explore the rest of the world. Oh no! I’m so sorry to hear Mila was injured but happy to hear it was nothing too serious and you were able to regroup! Hang in there! Thanks for keeping up with our trip. Hope to be blogging about less painful excitement soon! Were all so sorry to hear about your Mom’s arm. 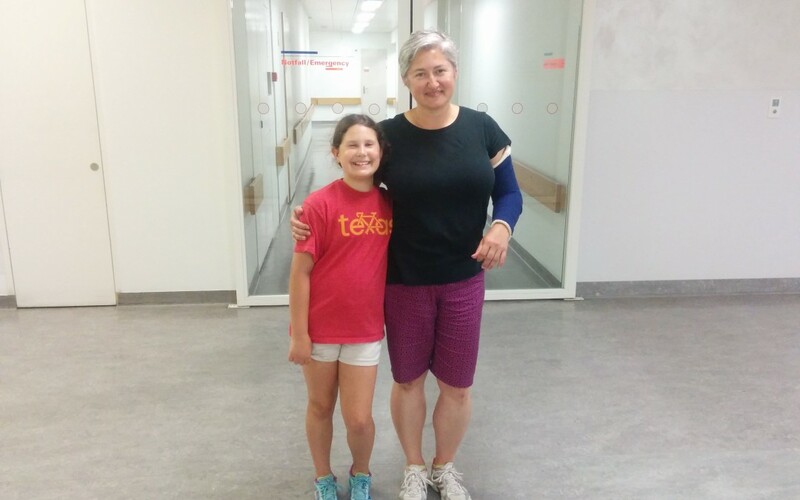 We know she will recover quickly and you will continue to have a GREAT adventure! Joshua and Dominic have been thinking of you as Hermoine, with Ron and Harry on there great adventure to find the Horcruxes. I bet it would be nice to have some magic powers for real to fix up your Moms arm? Joshua and Dominic have suggested electric motorcycles to ride, while still keeping a low carbon footprint so you can keep riding up the Rhine. You and your Mom on one electric scooter and your Dad could peddle fast on his bike or you could tow him on uphills. We had lots of fun discussing your adventure last night over dinner. 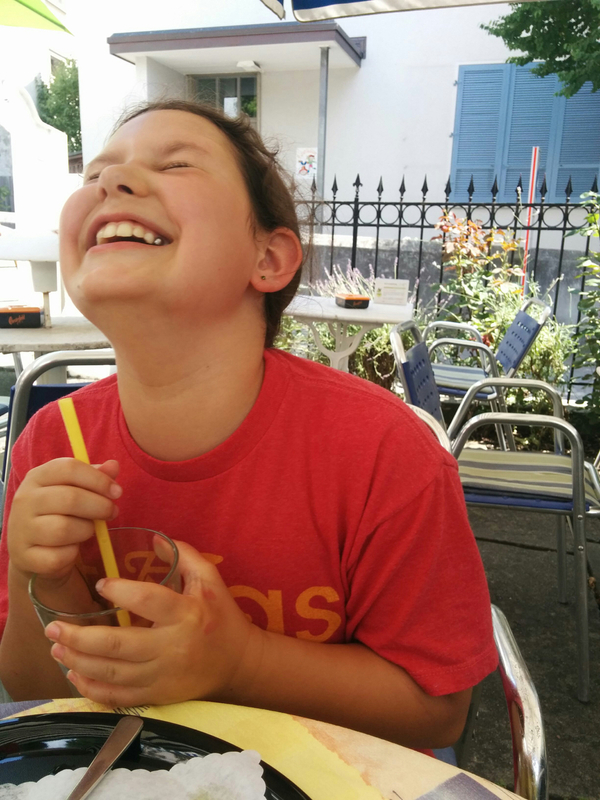 We went to Firefly ice-cream shop last night for national ice cream day and were reminded of the last time we saw you, which we think was at Firefly ice-cream. Hi y’all! Funny that you should mention Harry Potter. Jette has been talking about re-reading the series. Jette just finished The Red Pyramid. Have you guys read that one? She said it was really good and is going to read the rest of the series. We like the electric scooter idea, it sounds fun but too easy! Hope you are having a great summer and some fun adventures of your own. Hope next time we meet it is over ice cream again!!! Mila is a super hero, as well as wife and mom. She just keeps on going regardless. WOW! 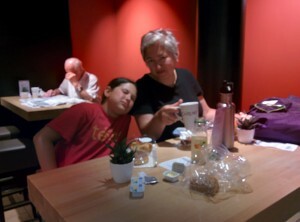 So, it is back to Amsterdam for rest, recovery and more fun. Jette’s grandkids may enjoy reading about these adventures someday. So sorry to hear about the accident. Mila is a trooper!! You made the right decision to let the arm heal before possibly stressing it again. The zip line was a fantastic birthday present and the whole trip is something very few Americans ever get to experience. These memories-and all that is learned-will last a lifetime!